Who knew!? According to a recent press release headline, plants apparently came from outer space and landed on Earth... at least if you believe a recent press release from University of Bristol about just published botanical research results by some of their researchers (February 19, 2018). If you then go on to read the research paper, you realize that the study they cite is really about LAND plants colonizing terrestrial areas, which sometimes are called earth, land, soil... any area above water. So this story is not about all plants, it is not about all of planet Earth; it is about LAND PLANTS and TERRA FIRMA. 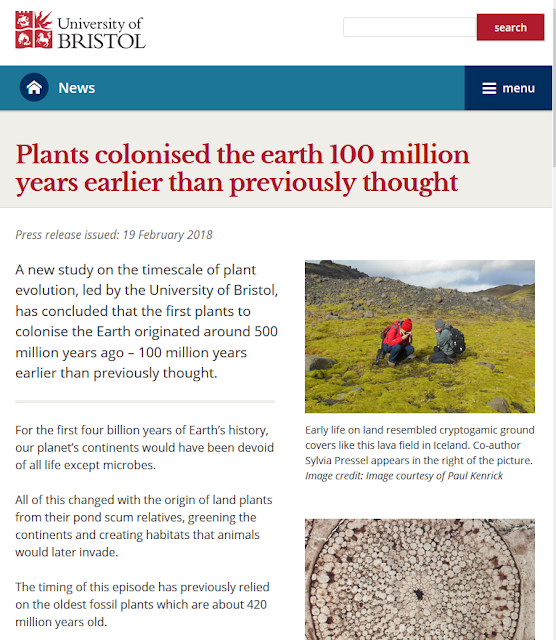 Screenshot of press release from University of Bristol, by BotanicalAccuracy.com (fair use). This headline conjures up an image of some green plant aliens with seed and spore bomb landing on planet Earth 100 million years earlier than some unspecificed time. Let's dig a little deeper in the press release. "A new study on the timescale of plant evolution, led by the University of Bristol, has concluded that the first plants to colonise the Earth originated around 500 million years ago – 100 million years earlier than previously thought. ."
INCORRECT. What is a plant? Is a plant just land plants? If so, then what are green algae? Again, what the authors mean here are land plants, not all plants. Land plants are green organisms that we find in terrestrial environments, from tiny mosses to giant Sequoias (not counting some terrestrial green algae). 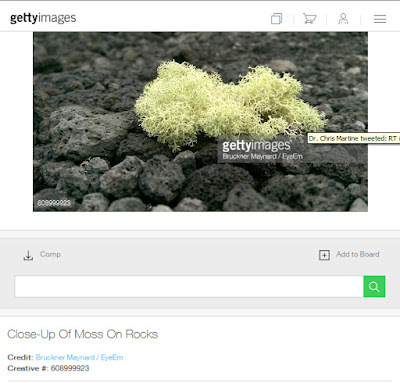 Some green algae (streptophytes) are more closely related to land plants than to other green algae (chlorophytes, yes, biological reality is complicated). The ancestors to land plants were ancient green algae from the streptophyte group, and green algae still live mostly in aquatic environments, both in seawater and freshwater. 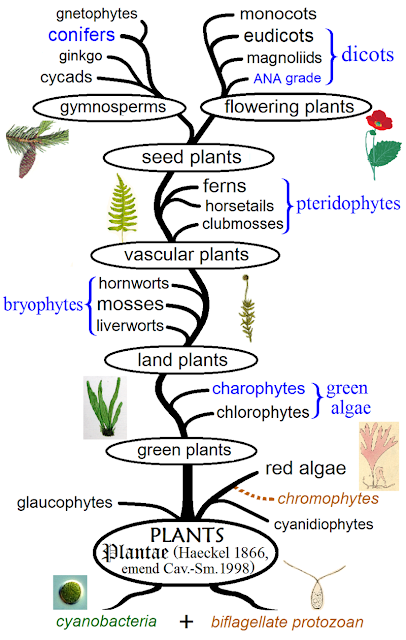 If you agree that we should classify life on Earth in groups that reflect their evolutionary relationships, then organisms from the red algae + green algae + land plants form a solid, good group for classification, simply called the Plants or Plantae (see the evolutionary tree below). However, an alternative explanation to this mistake in this press release is that the writers of this press release still followed the old 5-kingdom classification of life. This system has been shown over and over to not be correct evolutionarily, and therefore has been abandoned by modern researchers and taxonomists. The earlier system included ANIMALS, FUNGI, PLANTS, ALGAE, PROTISTS for the eukaryotes - and the Algae group has been shown to be a messy grab-bag of unrelated groups. If this is what happened, then it is time for a knowledge update for these scientists and the public - new information is always interesting and fun and fascinating, and science is about progress and increased knowledge and changes based on new data, so there is no excuse to hold on to old hypotheses and systems. Teaching the public about new taxonomic results and changes, including the difference (and similarites) between the closely related fungi and animals, or, explaining that the old groups 'Protists' and 'Algae' are a mish-mash grab bag of unrelated organisms that should not be classified together, is what scientists and journalist should do - it should be part of our job descriptions and job expectations. There is no need and no excuse to hold on to outdated information if you care about scientific accuracy. There is also no way we as individuals can keep ourselves updated on all new information that is coming out of science on a daily basis; that is why we turn to experts for fact checking and updates. Change, corrections, and updates should be welcome in science, and it is part of the scientific process and its progress. "For the first four billion years of Earth’s history, our planet’s continents would have been devoid of all life except microbes." PROBABLY NOT. Well, it depends on what you consider 'continents' and 'microbes'. Eukaryotes (living things that are not bacteria or archaea, and not viruses either) are known from at least 1.5 billion years ago, first as single-celled organisms and later as multi-cellular critters and plants (from maybe 800 million years ago, at least). The Earth is estimated to be 4.6 billion years old, that means there might have been eukaryotes in terrestrial environments even if we haven't found fossils of them yet. They simply might have been too small, not had shells or hard cell walls or other body parts that fossilize well, or not left many traces after themselves. There certainly was a lot of non-microbial life on continental shelves and in marine environments before 600 million years ago. "All of this changed with the origin of land plants from their pond scum relatives, greening the continents and creating habitats that animals would later invade." PARTIALLY TRUE. What is pond scum? That also depends. It can be green algae (chlorophytes) or cyanobacteria that form a foamy filmy layer on top of stagnant pond water. Green algae are a group of plants that are closely related to land plants (which are mosses, liverworts, conifers, ferns, and flowering plants, plus a couple of other small groups). But cyanobacteria are photosynthetic bacteria and have been around for many billions of years. Land plants also had and have a lot of relatives that are not associated with pond scum, for example sea lettuce, stoneworts, spirogyra, and gutweed (all from the two green algal groups, the chorophytes and the charophytes). "The timing of this episode has previously relied on the oldest fossil plants which are about 420 million years old." WELL... So, what are the oldest plant fossils? Again, that depends on your definition of plants. The oldest land plant fossils are about 420 million years old, but there are possible red algae fossils from 1.6 billion years ago and also from 1.2 billion years ago. There are plenty of additional algal fossils from more than 500 years ago. So, again, speaking about land plants, versus plants, make a big difference. CORRECT, BUT... (note how the land plants finally enter the story). Ancestors, evolutionary speaking, is not just one organism at one time. Ancestors and their extinct species and populations are lining up as a string of organismal pearls back into the distant, forgotten past. And if we continue to follow the ancestral lineages back in time for plants, it ends up at the common ancestor of all living things, common to bacteria to humans, to wolves, sea cucumbers and molds, and for magnolias and mosses and moths. The common ancestor for land plants only, that is different, that is the ancestral (and extinct) organism that is the closest ancestor to the now living land plants. A new study on the timescale of land plant evolution, led by the University of Bristol, has concluded that the first plants to colonise land originated around 500 million years ago – 100 million years earlier than previously thought. For the first four billion years of Earth’s history, our planet’s terrestrial areas would have been devoid of all life except microbes and other small organisms. All of this changed with the origin of land plants from their aquatic green algae relatives, greening the continents and creating habitats that animals would later invade. The timing of this episode has previously relied on the oldest fossil land plants which are about 420 million years old. New research, published today in the journal Proceedings of the National Academy of Sciences USA, indicates that these events actually occurred a hundred million years earlier, changing perceptions of the evolution of the Earth’s biosphere. Land plants are major contributors to the chemical weathering of continental rocks, a key process in the carbon cycle that regulates Earth’s atmosphere and climate over millions of years. WHY CARE? When science is communicated to the public, it is not only important that it is correct, but also that it is understandable by a broad audience. Clearly defined words and simplicity is necessary, but it absolutely needs to be correct. Otherwise it turns into botanical fake news that mislead the public and upset scientists. To assume that people only think about land plants when you use the word 'plants' assumes that the public does not know about green algae in oceans or in lakes, you ignore current scientific data, and it also shows that you as a scientist or journalist do not care about the details that build the real story. As scientists, we often get frustrated when there are factual inaccuracies in how our research results and scientific facts are portrayed by non-scientists. In this case though, it was the home institution of the research team that introduced these mistakes and inaccuracies in their own press release, and then, assuming it was of course correct, it was picked up by news media. This is highly unusual. More often it is a journalist without much scientific knowledge that introduces errors or simplifies too much from a press release that was accurate to begin with. Sometimes seemingly simple omissions (plants / land plants) and capitalization (Earth / earth) really makes a big difference, as shown in this story. 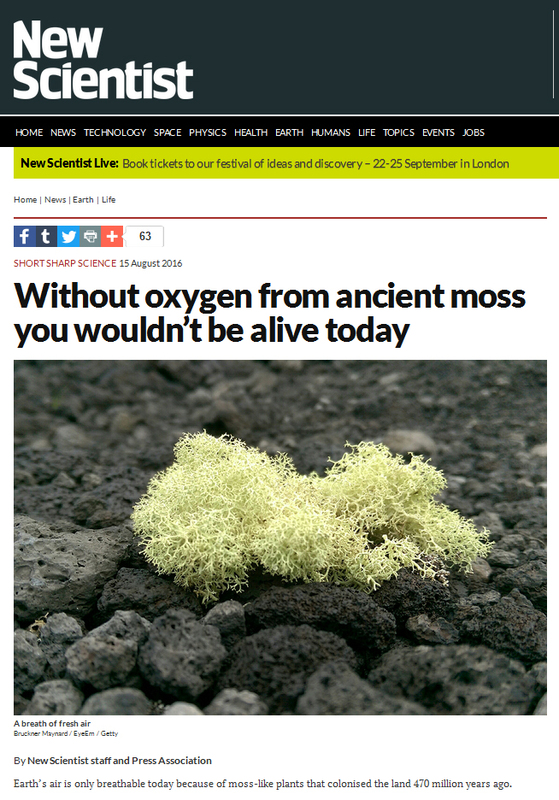 ScienceDaily picked up the story from the press release as is, as did Phys.org, Sci-News, Astrobiology Magazine. But look at BBC, and Atlas Obscura, and Science Magazine - they use the wording 'land plants' and have accurate information in their articles that were not direct copies of the press release. Kudos to them! Note. One person at the University of Bristol was contacted before this story was written and published on BotanicalAccuracy.com, and this person declined to reconsider word choices or make suggested corrections in the press release. It is also important to note that the issues highlighted in this blog post are only present in the press release from University of Bristol, not in the research paper itself, nor in the quotes from the scientists in the press release. So it is the dissemination of the research results that is the problematic issue here, not the research itself. The scientific name of the Chinese medicinal plant called Chinese milk vetch, also called Radix Astragali, huang qi in Mandarin, or 黄芪 or 黄耆 in Chinese characters, will be decided this year. 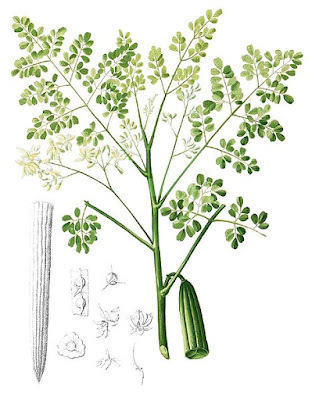 As explained in a previous blogpost, the name that has been in use for a long time, Astragalus membranaceus, is not available for use because it violates the rules of the Botanical Code. This can be fixed if the botanical community accepts an exception to the rules for this particular case. A proposal has been submitted to conserve the name Astragalus membranaceus published by Bunge, which would make it available for this species again. The proposal will be voted on by the botanical community at the International Botanical Congress in China in Summer of 2017. Here is the link to the blogpost with more information, with the update and details at the very end. We will report back after the decision is made - so right now the scientific name is kind of in limbo and everybody is waiting for a decision. 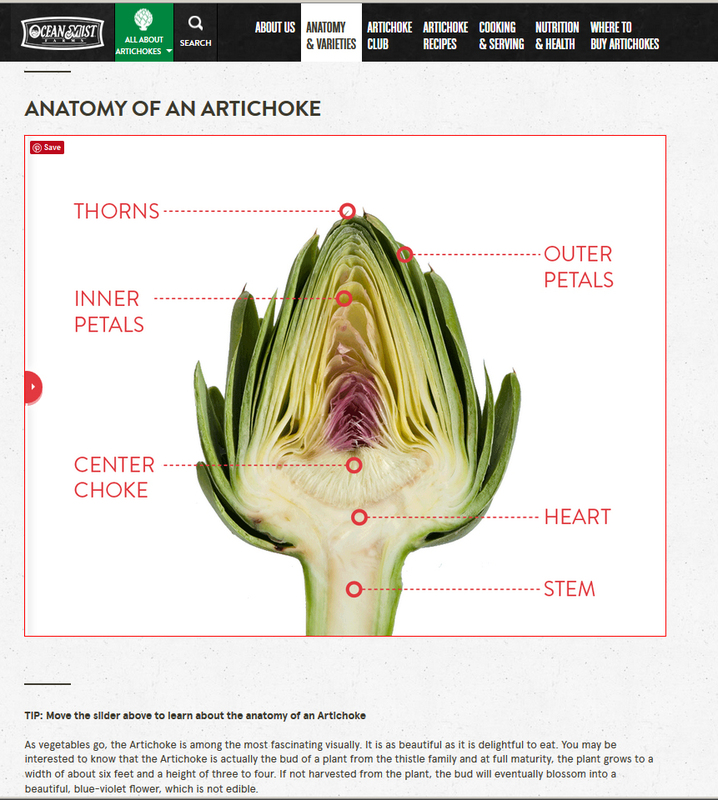 Screenshot of Anatomy of an Artichoke on the Ocean Mist website. Screenshot by Botanicalaccuracy.com, 29 Nov 2016 (fair use). 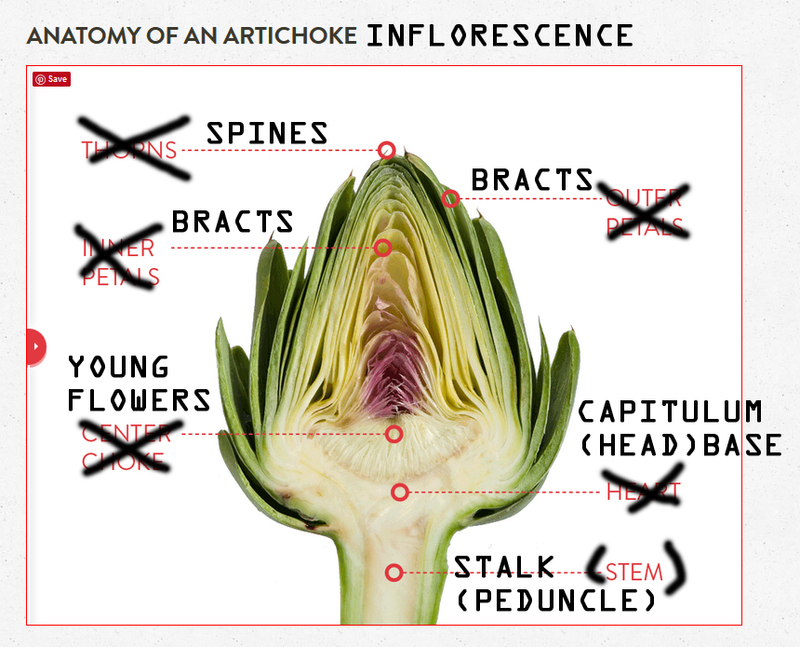 Unfortunately, the botanical facts about the artichoke head are not anatomically correct. "You may be interested to know that the Artichoke is actually the bud of a plant from the thistle family and at full maturity, the plant grows to a width of about six feet and a height of three to four. If not harvested from the plant, the bud will eventually blossom into a beautiful, blue-violet flower, which is not edible. 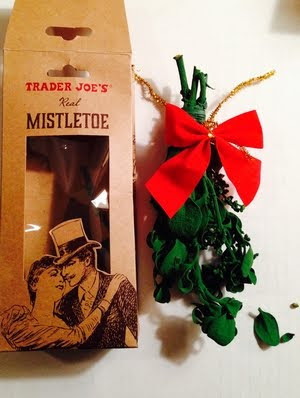 The bud contains the Heart, the delightful, meaty core of the Artichoke, and is topped by a fuzzy center, or choke, which is surrounded by rows of petals, which protect the Artichoke Heart. With their tiny thorns, the Artichoke’s petals reveal their thistle heritage." The artichoke is indeed a type of giant thistle, and if you let it flower it will open up to show a flower head similar to thistles, just much larger. But note the word HEAD, which is used for flower arrangements (inflorescences) that have tightly packed and unstalked flowers. The thistles are part of the sunflower family, the Asteraceae, which is also the home of dandelions, marigolds, tarragon, mugwort, chicory, lettuce, chrysanthemum, and dahlias. All of the species in this family have tiny flowers collected in a cup- or saucer-like head (capitulum), that is surrounded on the lower side by bracts (modified small leaves). The flowers are small and tightly packed, often with tubular narrow (disc) flowers in the center and sometimes with longer, flattened (ray) flowers along the edge, like in a sunflower. One group of species have only ray flowers, like in dandelions. In thistles, there are only tubular disc flowers, and the bracts are long and initially covers the whole sides and top of the head. "You may be interested to know that the Artichoke is actually the YOUNG FLOWER HEAD of a plant from the thistle family and at full maturity, the plant grows to a width of about six feet and a height of three to four. If not harvested from the plant, the HEAD will eventually blossom into a FLOWER HEAD WITH beautiful, blue-violet flowerS, which ARE not edible. The HEAD contains the Heart, the delightful, meaty core of the Artichoke, and is topped by a fuzzy center OF YOUNG FLOWERS, or choke, which is surrounded by rows of BRACTS, which protect the Artichoke Heart. With their tiny SPINES, the Artichoke’s BRACTS reveal their thistle heritage." It is not too late to learn and this is not an uncommon mistake in the food world. Hopefully they fix this information soon. If you want to dig deeper into the anatomy of artichokes, I recommend this post on the Botanist in the Kitchen blog. The confusion in what causes hay fever allergies has been a hot topic on this blog. Despite modern medicine and pharmacology being rooted in science-based medicine, it seems that advertising for the same medical offices and pharmacological products for allergy-reduction has not gotten the same message. 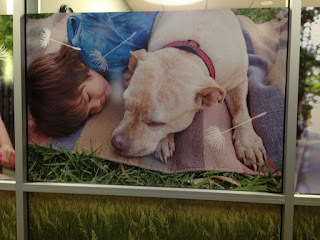 Here are some photos from the outside walls of the allergy clinic next to the place where I am attending a meeting this week. Image of wall advertising seen outside allergy clinic in Chattanooga, Tennessee, showing a child blowing the fruiting head of a dandelion. (c) photo by Botanical Accuracy, 2016. 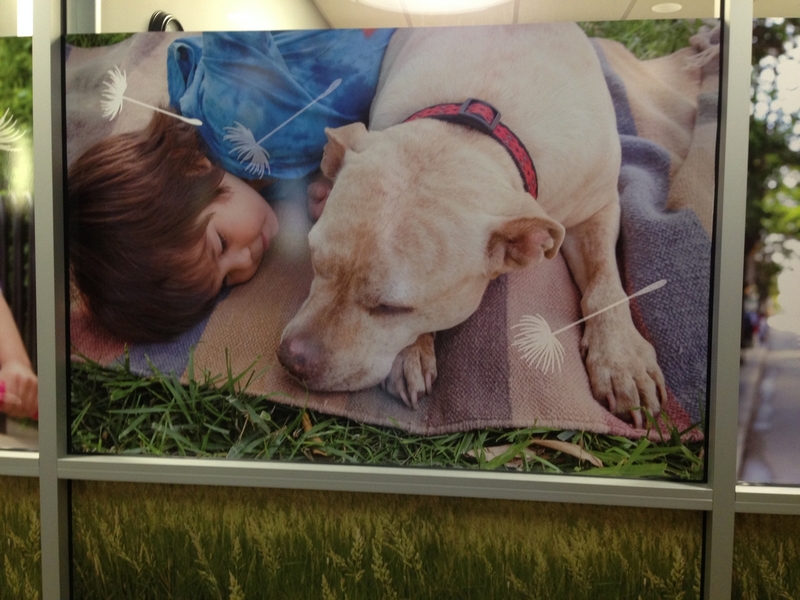 Image of wall advertising with child, dog, and superimposed dandelions seen outside allergy clinic in Chattanooga, Tennessee. (c) photo by Botanical Accuracy, 2016. 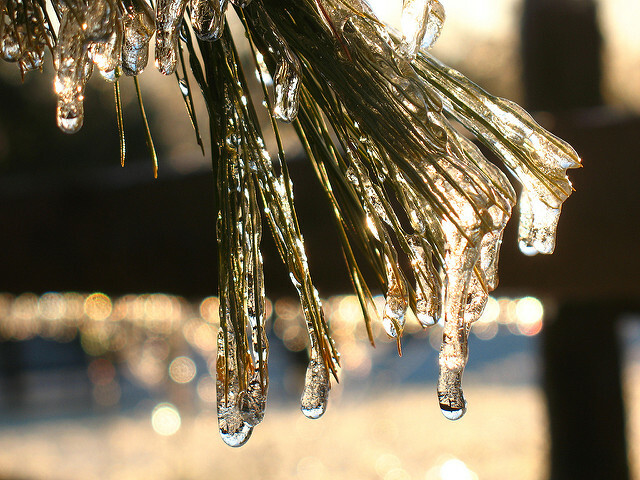 Most hay fevers are caused by wind-dispersed POLLEN, which comes from tiny but mighty wind-pollinated flowers, such as those present in grasses, mug worts, birches, and ragweeds. Dandelion flowers are insect pollinated (as explained here). Dandelion fruits (or commonly called 'seeds), which are actually one-seeded small nuts (a kid of fruit) with a long stalk and umbrella of hairs to fly away, are not allergenic. They just fly in the air, and gets to represent the invisible pollen that also fly in the air at the same time. Unfortunately, this make people dislike dandelions even more. Image of wall advertising showing walking couple in meadow and superimposed dandelion fruits, seen outside allergy clinic in Chattanooga, Tennessee. (c) photo by Botanical Accuracy, 2016. I can't help wonder if the highly educated, science-minded doctors in this office know about this mistake. Wouldn't it be interesting to do a survey to see what allergy doctors actually know about wind-pollinated plants, wind-dispersed fruits, and common allergenic plants? I think it is about time that these doctors also should point out to the pharmaceutical companies and marketing designers that 'sorry, we only do science-based advertising and prescription here'. mage of wall advertising showing biking child and superimposed dandelion fruits, seen outside allergy clinic in Chattanooga, Tennessee. (c) photo by Botanical Accuracy, 2016. I know that the general skin test that you can done might come back saying that you are allergic to 'trees and weeds'. This is about as broad as saying you are allergic to 'mammals and garden pests'. It is so non-specific and inaccurate that it is not useful if you want to actually know what you are allergic to. But be sure, dandelions are not the culprit, and should not be plastered all over doctors' offices and allergy medication ads. Or, When the world's tallest dandelion isn't a dandelion. The motto of The Guinness World Records is OFFICIALLY AMAZING. And that it is, officially amazing, but not only in the sense that they might think. When I was a kid in Sweden I loved their orange-colored book, (1975 edition, maybe?) and I read everything in it, and stared at the photos of the man with the longest nails (how did he eat?) and the largest cat, amused and entertained and informed. 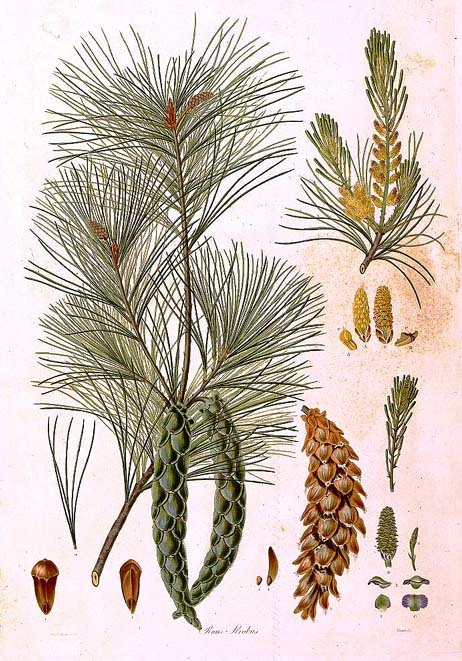 Now I get to come back to this memorable source of trivia, but this time for a botanical and work-related reason. There is no photo of the plant on the record website, unfortunately, but there is a youtube video uploaded by JO Riding, telling the whole story of finding and measuring of the plant. 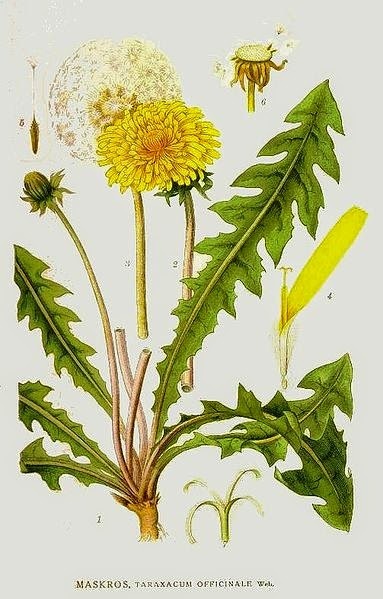 There are many species related to dandelions (genus Taraxacum) that are similar to dandelions in having yellow flower heads and 'puffball' seed heads that eventually blow in the wind, but they are not dandelions, they below to other genera. All of these are members of the sunflower family (scientific name Asteraceae), and dandelion and its relatives are members of the Cichorieae (aka Lactuceae) subgroup (=tribe) that has members with milky sap (latex) that you can see if you break a leaf or stem. 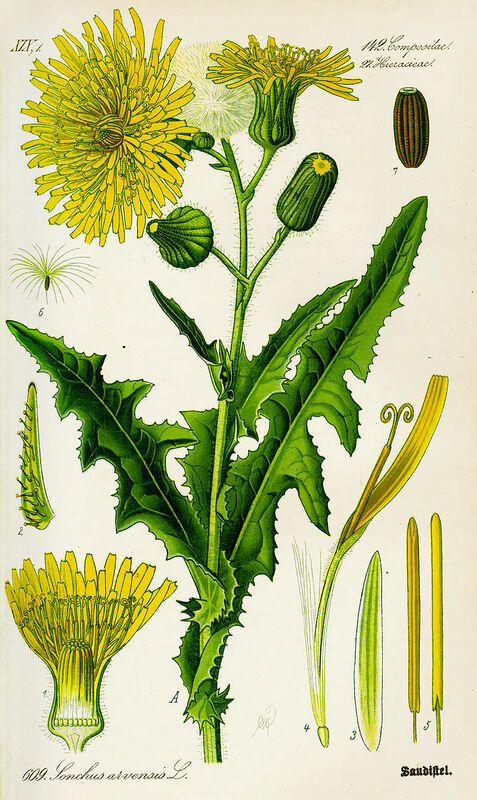 Dandelion (Taraxacum) from Lindman's Bilder ur Nordens flora, Public Domain. Here is a real dandelion, a species in the genus Taraxacum. 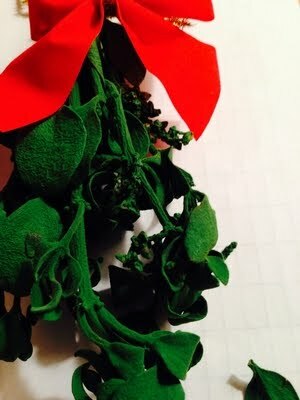 All the leaves are in a basal rosette at the base, and from the middle of the rosette a light-colored, hollow stem comes up and holds just one flower head. There is a big taproot under the plant that can survive year to year, and that is why they are so hard to get rid of - you have to dig them out. It is a perennial problem - cut the flower head stalk off with your lawn mower and it just sends up a new one from its low stem and perennial root. Otto Wilhelm Thomé Flora von Deutschland, Österreich und der Schweiz (1885), Public Domain. And here is a weedy look-alike, but check out the differences in the position of the leaves and the branched stems with many flowers. This is a milk thistle (Sonchus), which is probably what was reported from Ottawa as the world's tallest dandelion. 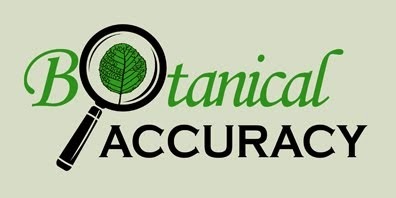 It is unclear if the two Ottawa companies that certified its height, Nutri-Lawn and Weed Man, also certified its species identity, but both companies should be very familiar with dandelions and other weedy species. Nutri-Lawn is a lawn care company specializing in "ecology friendly lawn care" and Weed Man, another gardening company has a very funny green man as their home page mascot. It might be that Guinness World Records didn't ask for species verification. Screenshot from The Telegraph (UK) website (link) by BotanicalAccuracy.com, 18 Aug 2016. Fair use.
" Mr Daniels is keen to get his dandelion officially measured as soon as possible before it starts to wilt or dry out. He added: "I'm not a gardener hence why I'm growing a dandelion, it is just luck that it has grown so big as I have done nothing to it over then let it grow." A Guinness World Records spokesman said: "We invite the claimant to make an application via our website in order for us to be able to ratify the achievement." This is not a dandelion either. All those little flower heads in a strongly branched inflorescence and the leafy stems with bluish-green leaves with light-colored mid veins indicate that this seems to be Lactuca, maybe prickly lettuce (Lactuca serriola). Lactuca is the same genus as your supermarket lettuce, but this is a wild species. 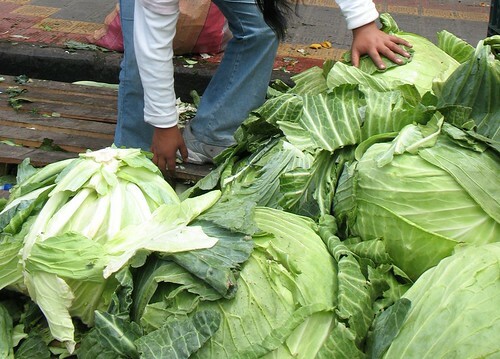 This is how Lactuca looks like. Some species have blue petals, other yellow. Wild lettuce or prickly lettuce (Lactuca serriola) from Köhler's Medizinal-Pflanzen, Public Domain. For the record, WeedZilla with a height of 12 feet isn't the World's tallest dandelion either, that is something else in the sunflower family. 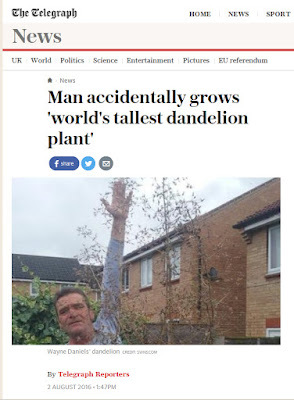 It is a giant weed indeed, but not a dandelion. Sorry. The strange thing is that dandelions are not hard to identify with certainty if you know what to look for. The book Foraging & Feasting: A Field Guide and Wild Food Cookbook by Dina Falconi includes a great 'plant map' illustrated by Wendy Hollender of all the good key characters for dandelions. 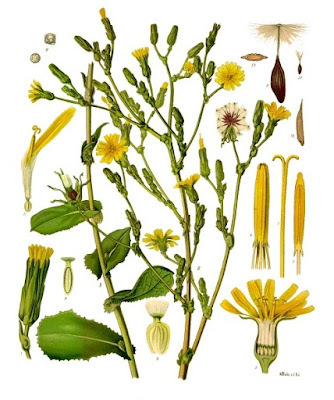 You can also read about dandelion's great benefits and ancient ethnobotanical uses. I am not writing this to point out that people identify plants wrong. That happens all the time, and is just a matter of education, curiosity, and interest in plants that live around us. There are plant identification forums online with over 50 000 members, and the fact that people are curious about strange, cool, and giant plants is a great thing. People should ask about plants, and let themselves be amazed by them. It is OK to know little, especially if you want to know more and satisfy your curiosity. The problem is the fact checkers at Guinness World Records who put themselves and their company into this embarrassing situation. First, they should make sure they actually have the right species in hand. The easiest for this is to have photos of the plant while alive, you know 'pics or it didn't happen!'. 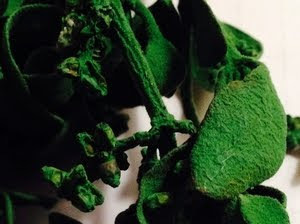 They should also require a pressed specimen of the plant, not just air dried, but pressed between newspaper sheets so it is preserved and flat. That way specialists can look at it later and say: "yep, you have a true dandelion! ", or "sorry, that is a milk thistle, nice plant anyway!" This is called vouchering and is standard practice for all species reports, including DNA testing, species inventories, herbal plant identification, and chemical analysis. There is no reason why Guinness World Records could not implement this, and have a botanist verify the species identification and have a link to an actual preserved specimen (the proof). So, what is truly the record for world's tallest dandelion? Well, there are reports out there that show real dandelion (Taraxacum species). So far, the record seems to be the dandelion found by a Norwegian boy, Bjørn Magne, with a 108 cm (42 inches) long flower stalk, and reported to World Record Academy in 2007. Before then, the Guinness World Book of Records had a 39-inch tall Swedish dandelion from 2003 as a record holder. The Nordic countries seem to be great for further giant dandelion exploration. To inspire you, here are some dandelions on Iceland's lava-covered plains in the never-setting sun of Nordic summers. 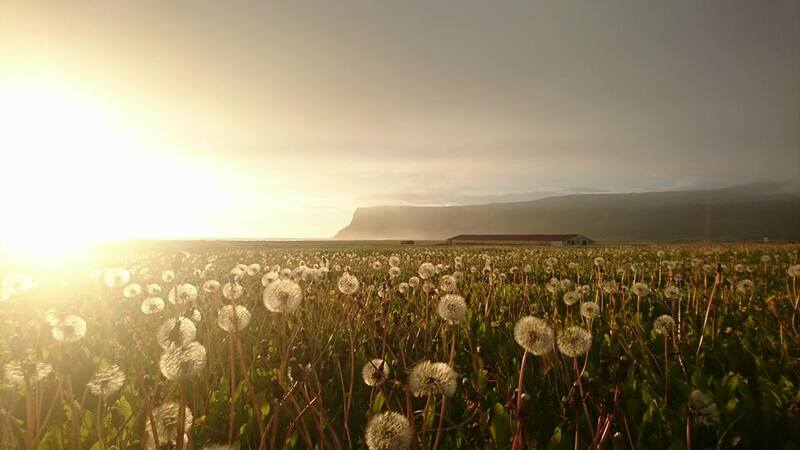 Dandelions on Iceland. Photo and copyright by Didrik Vanhoenacker (thanks for letting me borrow the photo). PS. Thanks to Asteraceae specialist Torbjörn Tyler, field biologist-on-call Didrik Vanhoenacker, professor emeritus Arthur Tucker, and dandelion taxonomist Luc Brouillet, who all helped and gave feedback on research for this blog post.